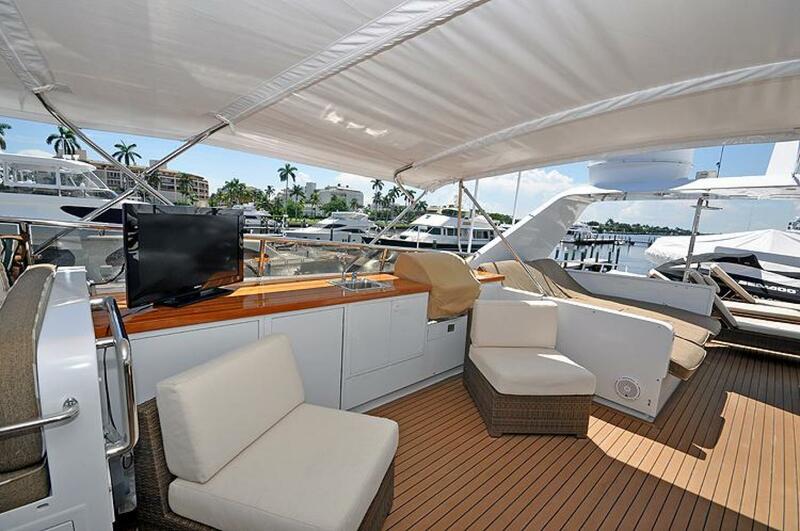 PG's JESTER, one of the few modern 24' beam Raised Pilothouse Motoryachts, was built at the peak of Broward Marine's production. In addition to the obvious extra interior volume provided by the significant increase in beam, PG's JESTER features full walk-around decks, aft engine room, accommodations for eight guests in four staterooms plus crew quarters for five. 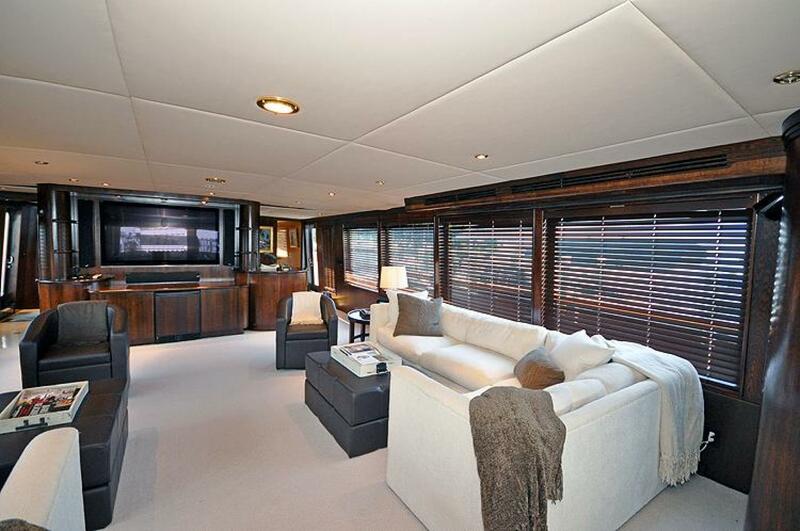 The main deck is an open arrangement plan with a tremendous feeling of light and space with numerous oversized windows and atrium effect in the salon. 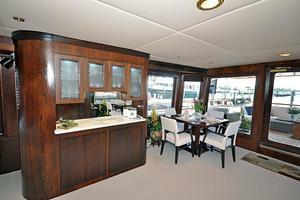 PG’s JESTER has benefited numerous upgrades over the past years to include complete paint job, 3' swim platform addition, new custom varnished teak cap rails, teak & holly overhead panels for aft deck, and in 2009, all electronics were updated. 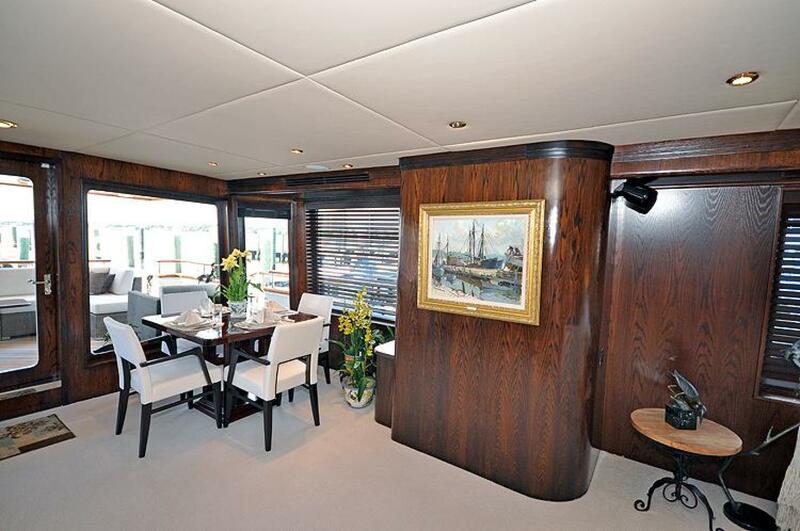 In 2010/11, she received a major refit with a complete Matterhorn white awlgrip paint job, new interior with stained walnut joinery, new carpet, new soft goods throughout, new custom furnishings, new flat screen TV's and surround sound systems. 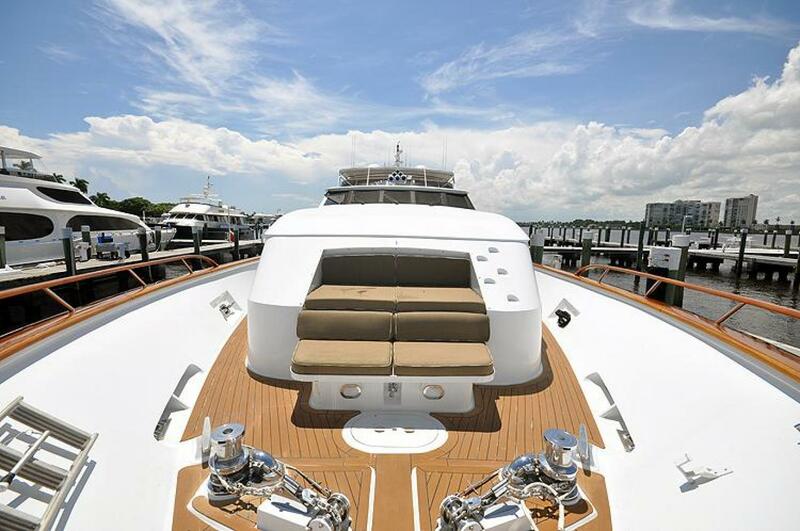 Powered by majored DDEC 16V-92’s, PG’S JESTER cruises comfortably at 16 knots with a 20 knot top end speed and 7700 gallons of fuel provides for extended range. 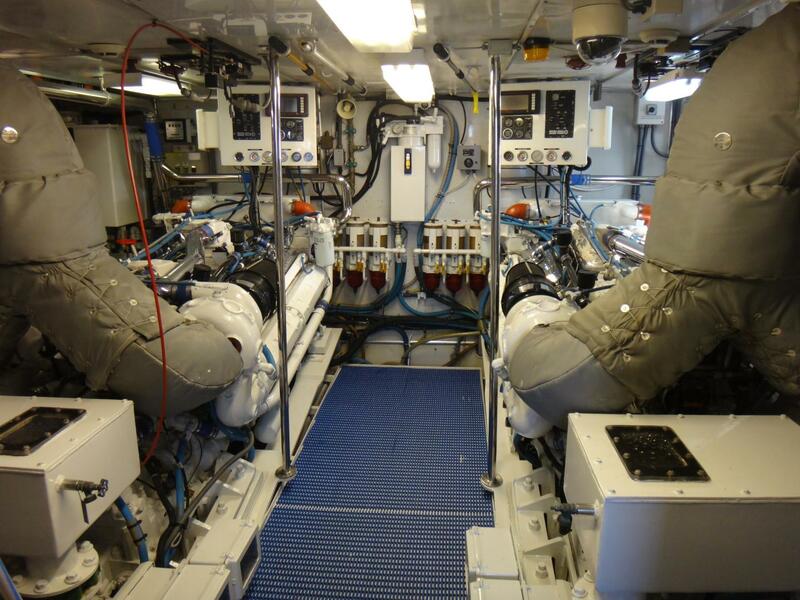 In Aug. 2013, the sea chest was completely rebuilt to new condition, anchor windlass rebuilt, new A/C compressor and two new sets of GE washer/dryers added. 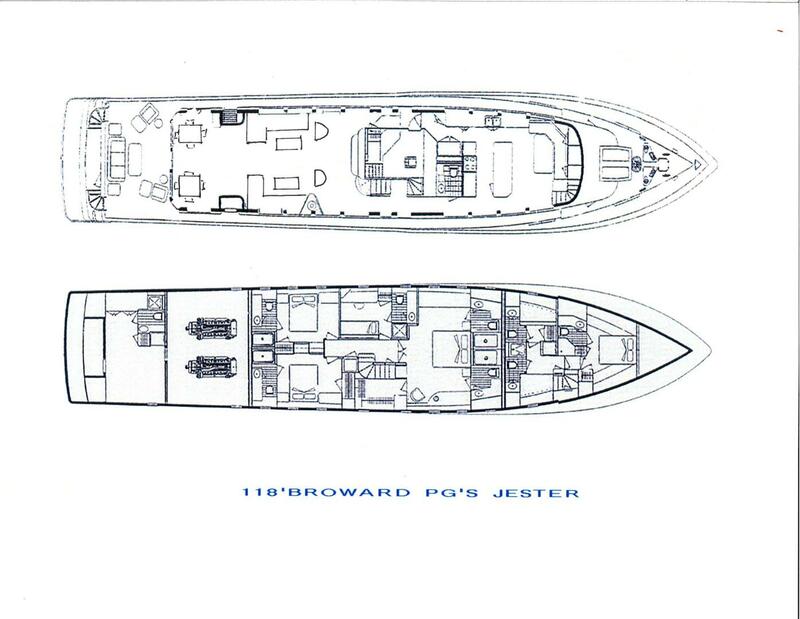 PG's JESTER, one of the few modern 24' beam Raised Pilothouse Motoryachts, was built at the peak of Broward Marine's production. 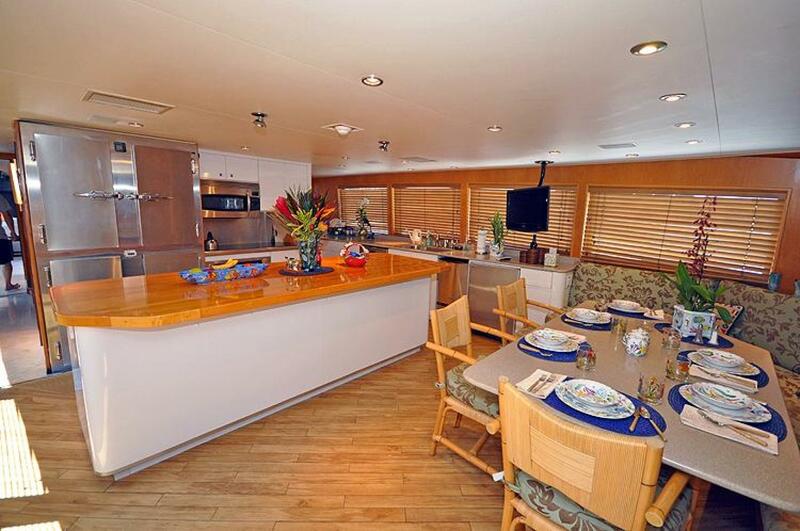 In addition to the obvious extra interior volume provided by the significant increase in beam, PG's JESTER features full walk-around decks, aft engine room, accommodations for eight guests in four staterooms plus crew quarters for five. 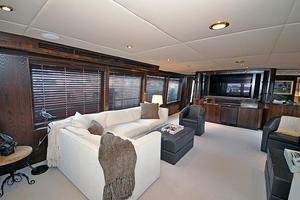 The main deck is an open arrangement plan with a tremendous feeling of light and space with numerous oversized windows and atrium effect in the salon. 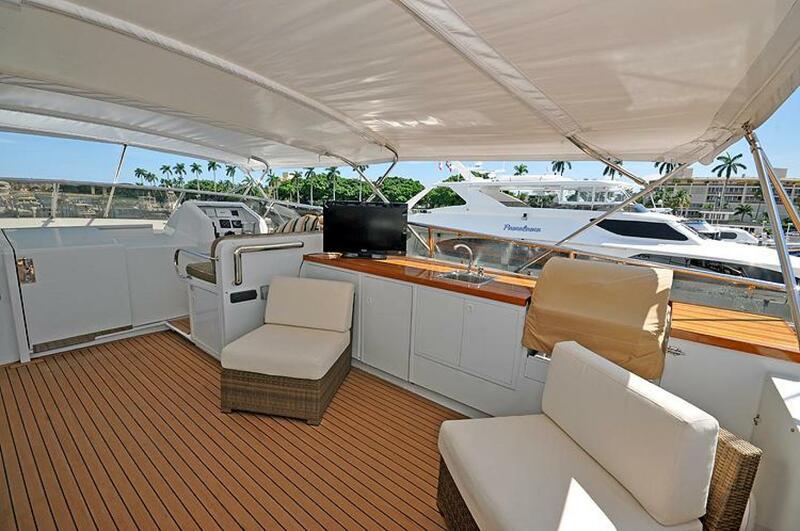 This yacht has benefited numerous upgrades over the past years to include complete paint job, 3' swim platform addition, new custom varnished teak cap rails, teak & holly overhead panels for aft deck, and in 2009, all electronics were updated. 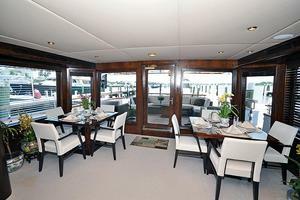 In 2010/11, she received a major refit with a complete Matterhorn white Awlgrip paint job, new interior with stained walnut joinery, new carpet, new soft goods throughout, new custom furnishings, new flat screen TV's and surround sound systems. 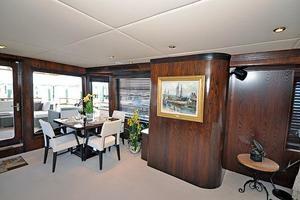 The main salon is entered via a large centerline door from the aft deck or from the port or starboard entry foyers amidships. 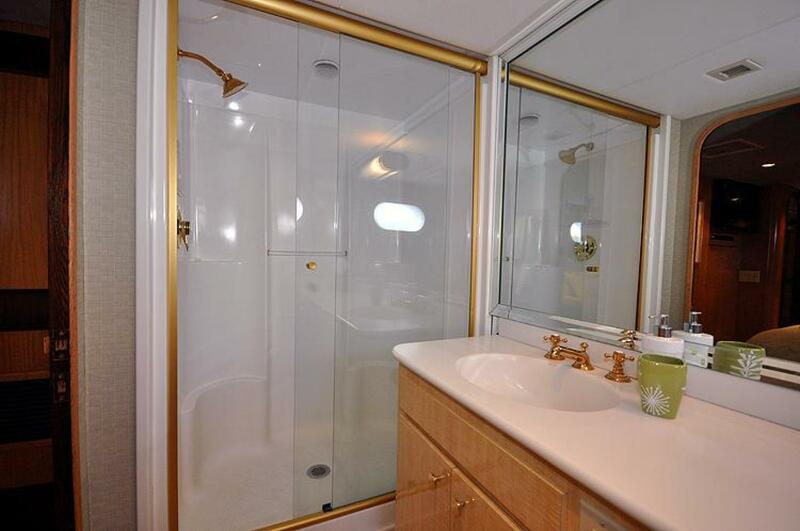 This area offers a tremendous feeling of openness and light which is enhanced by numerous 2/3 full height windows throughout the salon. 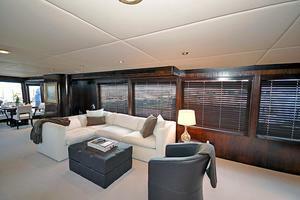 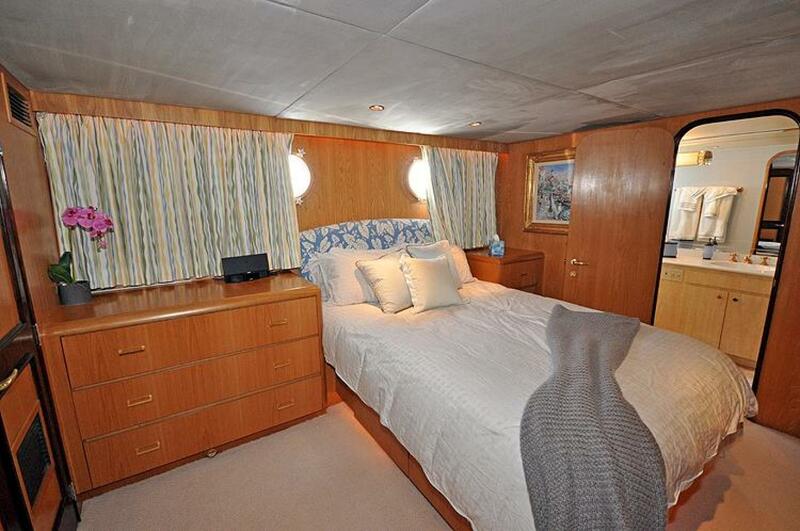 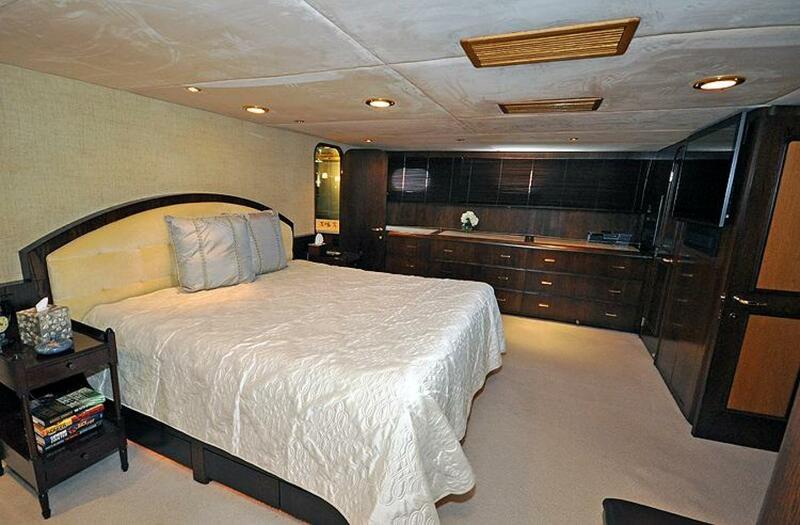 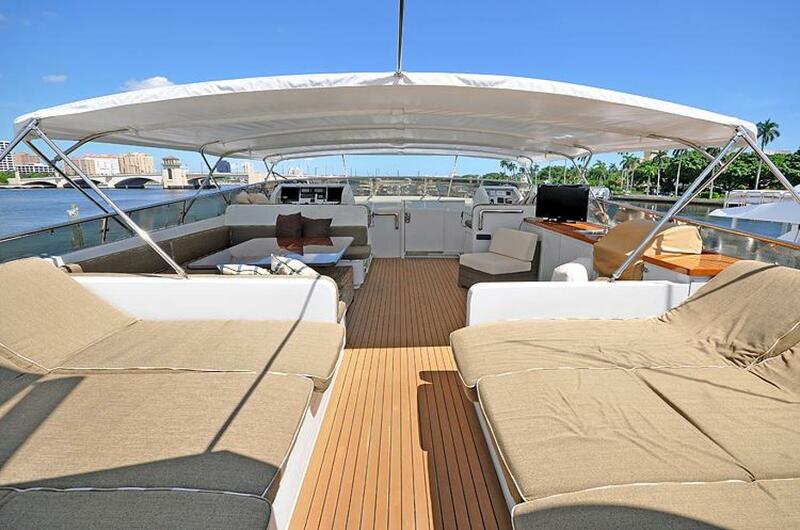 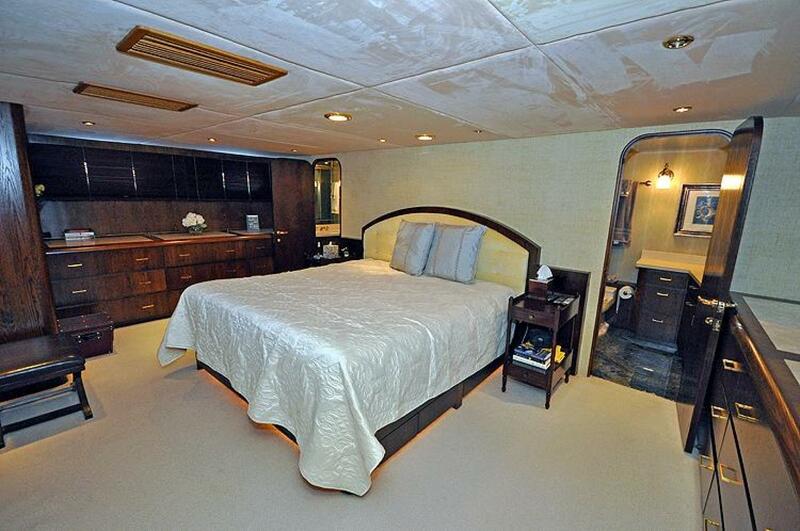 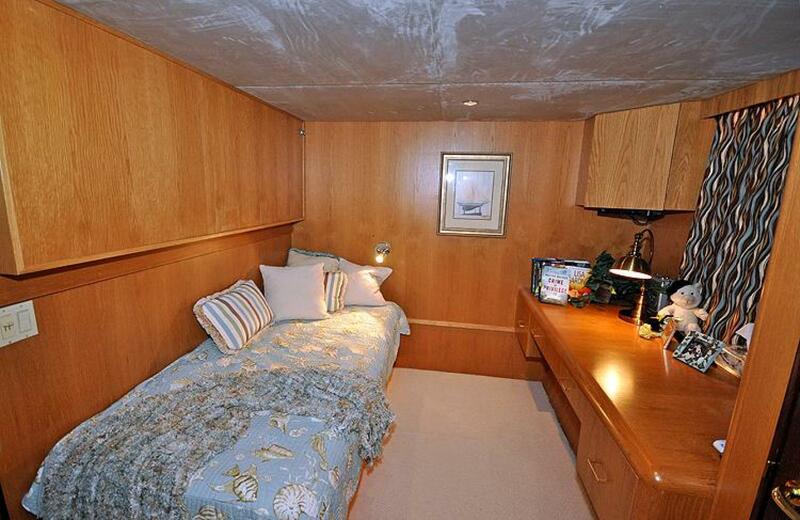 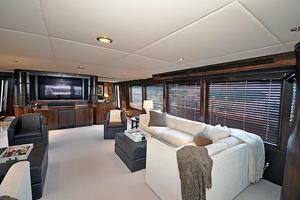 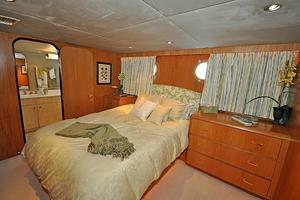 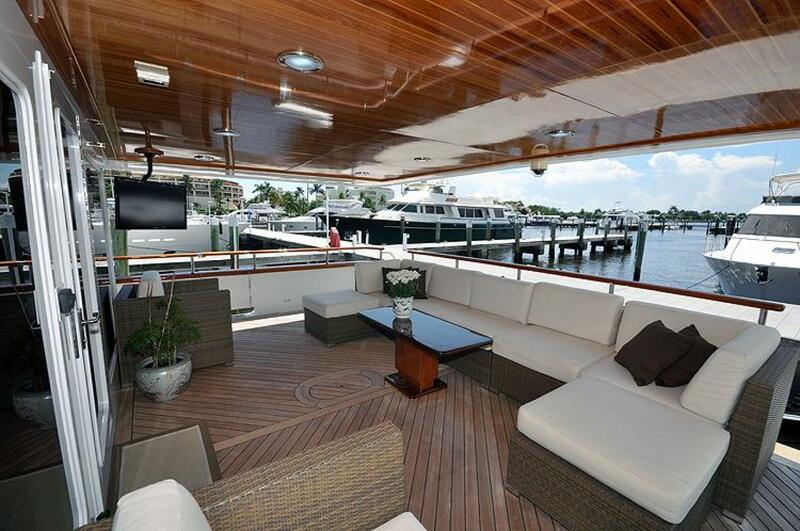 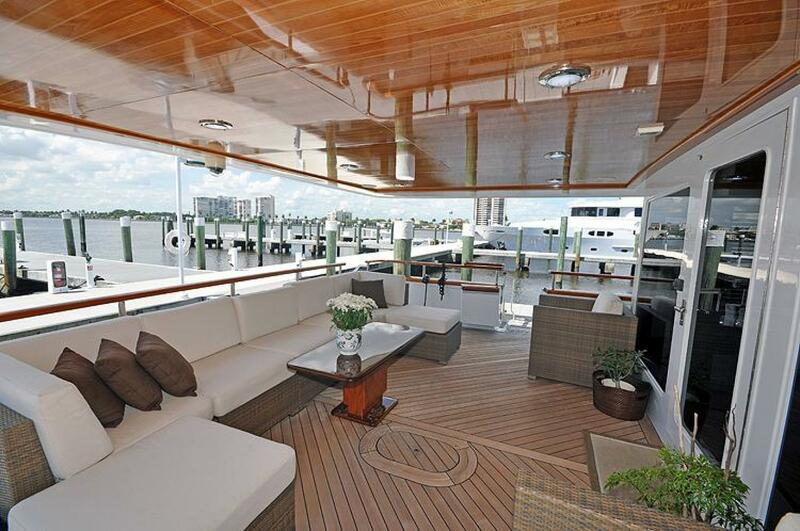 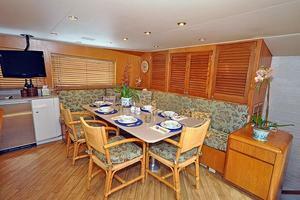 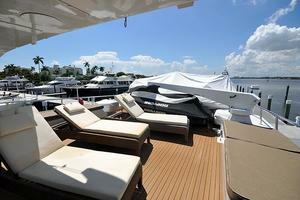 Her interior refit in 2011 included refinished stained walnut joinery, new custom furniture, new carpeting, Sony 3D 60" TV entertainment center, walk-up bar and electric wooden blinds. 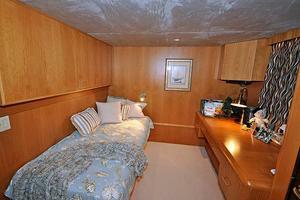 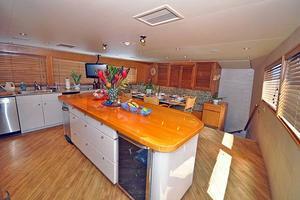 Forward, the galley can be entered from either the port or starboard amidships entry foyers. 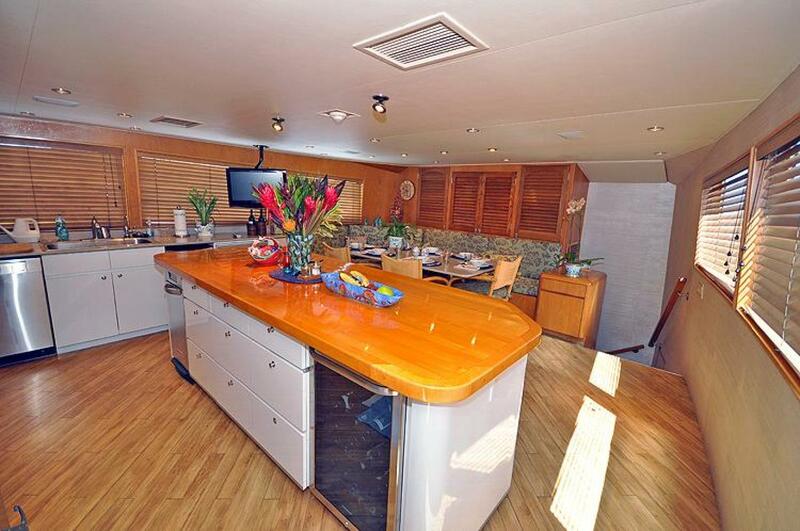 Highlights include stainless steel appliances, a commercial grade fridge/freezer and large butcher block topped center island. 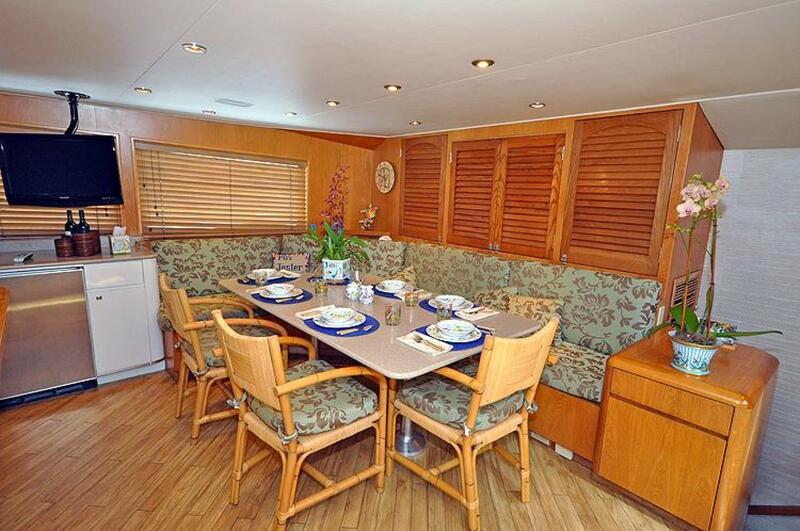 Forward of the galley area, a large upholstered settee and dining table accommodates up to eight and doubles as the crew lounge/mess. 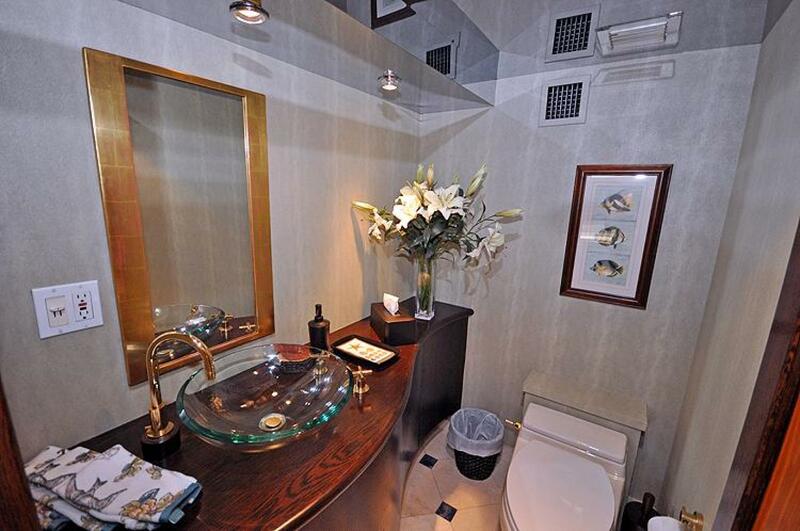 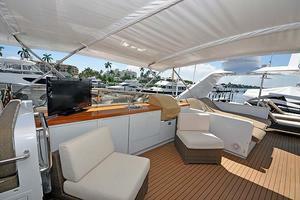 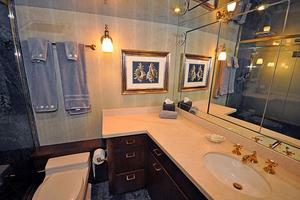 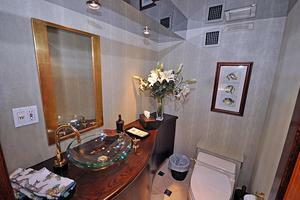 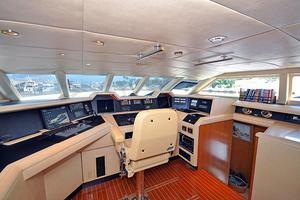 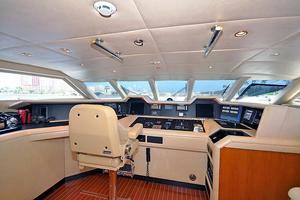 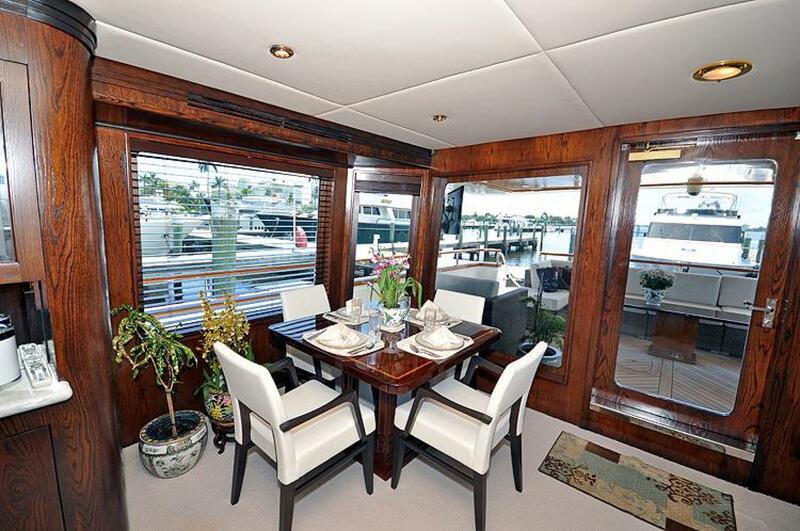 The pilothouse is accessed from the starboard foyer and up five steps is the pilothouse. 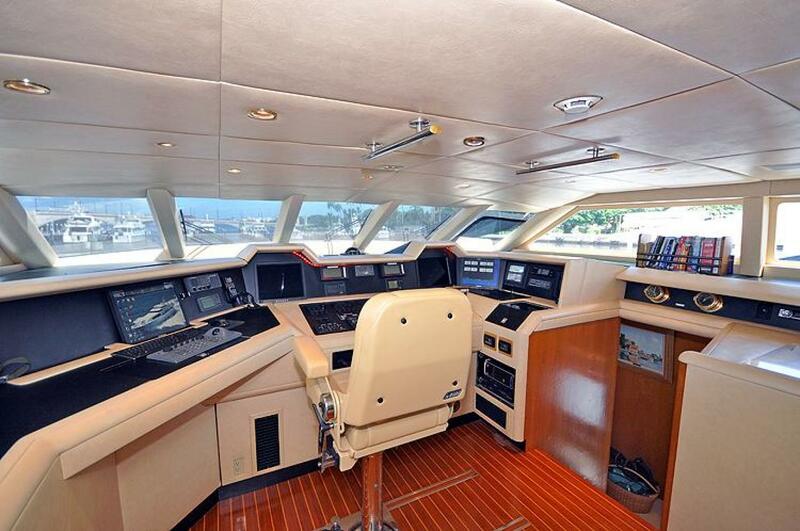 The helm area is modern and completely up-to-date with sophisticated navigation, communications and machinery monitoring equipment. 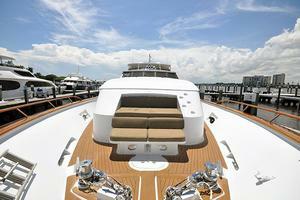 An adjustable electric Stidd helm chair can also be moved side-to-side on tracks recessed in the teak and holly sole. 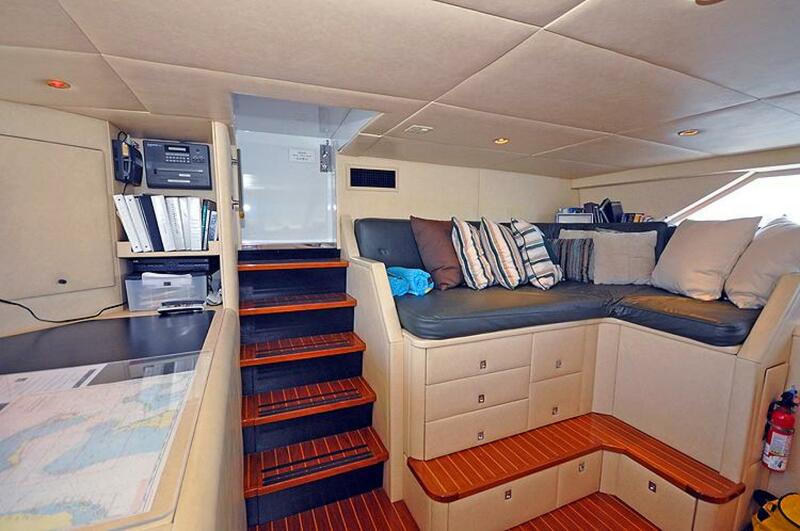 This area features built-in settee lounge w/seating to port and ample storage. Stairs lead to sliding flybridge hatch. 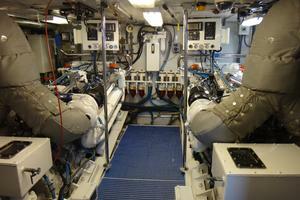 New exhaust risers added both engines in 2012. 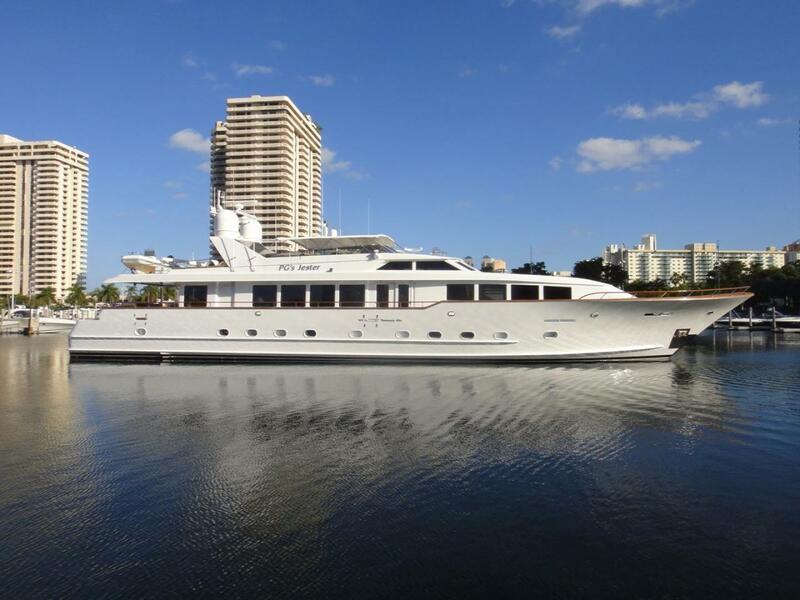 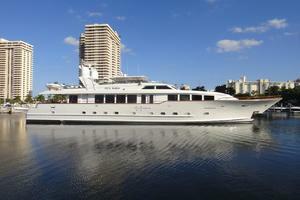 PG's JESTER, one of ten modern 24' beam Raised Pilothouse Motoryachts, was built at the peak of Broward Marine's production. 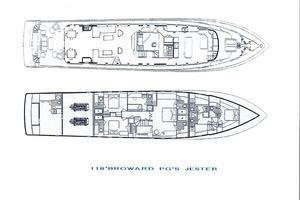 In addition to the obvious extra interior volume provided by the significant increase in beam, PG's JESTER features full walk-around decks, aft engine room, accommodations for eight guests in four staterooms plus crew quarters for five. 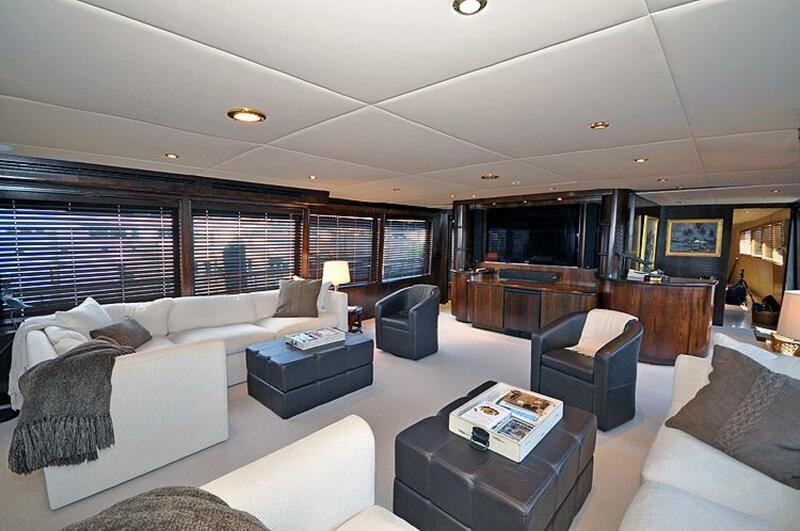 The main deck is an open arrangement plan with a tremendous feeling of light and space with numerous oversized windows and atrium effect in the salon. This yacht has benefited numerous upgrades over the past years to include complete paint job, 3' swim platform addition, new custom varnished teak cap rails, teak & holly overhead panels for aft deck and in 2009, all electronics were updated. 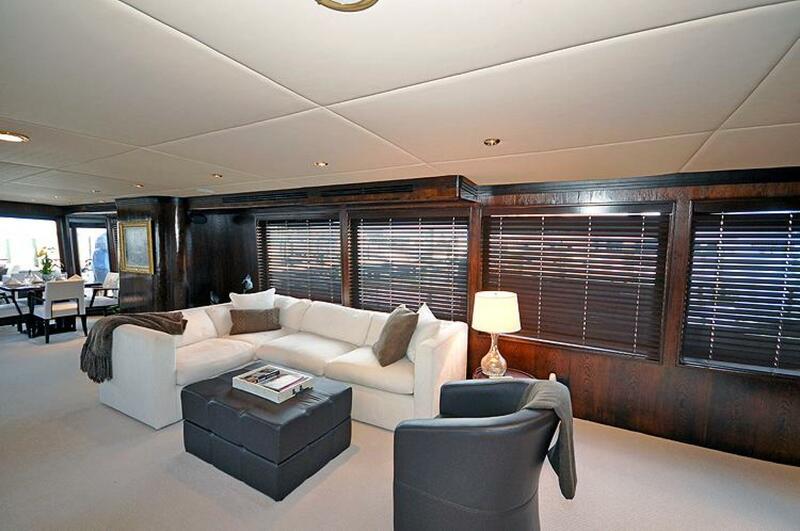 In 2010/11, she received a major refit with a complete Matterhorn white awlgrip paint job, new interior with stained walnut joinery, new carpet, new soft goods throughout, new custom furnishings, new flat screen TV's and surround sound systems. Powered by majored DDEC 16V-92’s, PG’S JESTER cruises comfortably at 16 knots with a 20 knot top end speed and 7700 gallons of fuel provides for extended range.